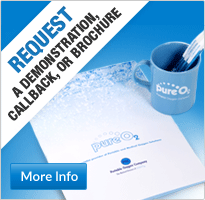 The SeQuel EQuinox is a portable oxygen concentrator available from Pure O2. At Pure O2, we simply do as our name suggests; we supply oxygen to people with respiratory disorders, which enables them to carry on with their lives instead of being stuck at home or in even in a hospital. Supplying portable oxygen concentrators to patients with COPD or other breath restricting medical problems, means we can offer people not just air to breathe, but hope and enjoyment in their life again. The SeQuel EQuinox is one of our portable oxygen concentrators which we have available to buy or hire according to your needs and budget. What is so good about the SeQuel EQuinox portable oxygen concentrator? There are many good features to the SeQuel EQuinox portable oxygen concentrator. Obviously, it is portable – it is delivered with a trolley which is easy to pull along. It is very easy to use, having an LED display showing the oxygen flow delivery rate, lights to indicate the flow mode it is working in, as well as a voice prompt, which helps those with restricted sight. The voice prompt can be selected from a range of language options. Compared with other 3l continuous flow units the SeQuel EQuinox is about 33% smaller in size. 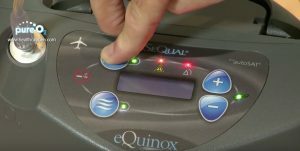 The main unique feature about the SeQuel EQuinox, is that it uses new technology to detect if the patient has not taken a breath and will move from pulse to continuous flow mode until a breath is taken. The SeQuel EQuinox is also one of the quietest portable oxygen concentrators of its capacity on the market. Registering only 45db at a 2 continuous flow rate. This means that there is less disruption to the user’s sleep patterns helping them feel more refreshed in the morning. 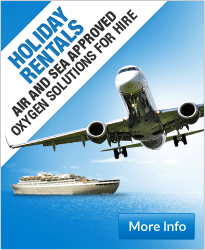 Have you been wishing you could take a break and go on holiday but didn’t dare because of your oxygen requirements? With the SeQuel EQuinox you can travel to your hearts content as the SeQuel EQuinox is approved for use on all the major airlines, so what are you waiting for? Get out those holiday brochures and start planning your next trip! How can I find out more about the SeQuel EQuinox? To find out more about SeQuel EQuinox you can take a look at our webpage where you can also watch a short video http://www.healthoxygen.com/portable-o2/sequal-equinox.html. Alternatively to discuss your own particular requirements with our friendly and trusted team of advisors give us a call on 0870 712 0202, or you can use our UK freephone number (9am – 5pm) on 0800 145 5902 or if you’re are calling from overseas you can use our international number +44 (0)161 747 2617. 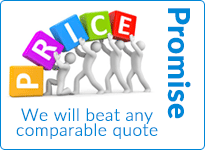 For more information about us and the range of products we can supply, get in touch with us today.